Majestic museum located in the Jubilee Park of Brussels, in-holds prestigious collections illustrating Belgium's History and great civilizations and cultures of the World. Discovering all the sections of the museum will take you on a World Tour of its own ! Autoworld is a museum dedicated to automobile industry. Located in South-East Halle of Jubilee Palace its structure was made of Steel and Glass for 1897 Universal Exhibition. Museum presents more than 300 collection cars from 1886 (birth of automobile) till 1960. Also visible a collection of Hippo-mobile and a collection of motorcycles. making this museum one of the biggest Military museum worldwide. Magritte Museum was settled in an old Neo-classic building from the end of XVIIIth Century. The building is part of an architectural whole that was built after a fire in 1731. Owners turned it into a hotel, a jewelery and then finally a museum. National Science Museum is located in Brussels in the Léopold Park near European Parliament building. This museum is part of Royal Institute for Natural Sciences of Belgium. 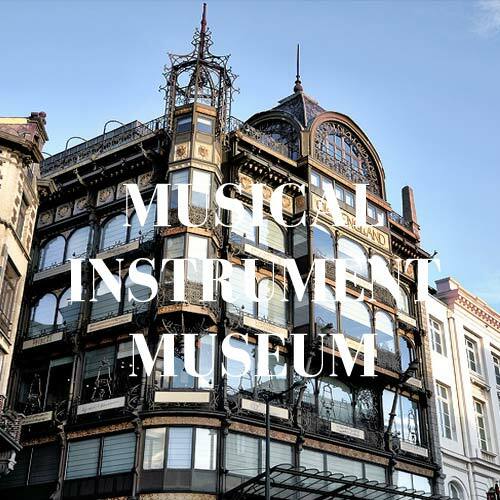 The Musical Instrument Museum is a music museum in central Brussels, Belgium. It is part of the Royal Museums for Art and History and internationally renowned for its collection of over 8,000 instruments. Pavilion of Human Passions also known as the "Horta-Lambeaux Pavilion" is a structure of Neo-Classical Style designed by Victor Horta in Jubilee Park. This Pavilion has signs of Art-Nouveau style.It was originally designed to hold a large Marble relief "The Human Passions" designed by Jef Lambeaux.